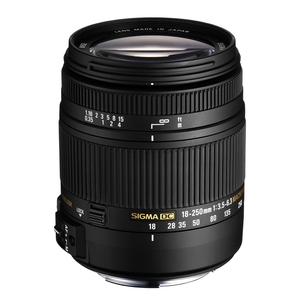 Sigma 18-250mm f3.5-6.3 DC Macro OS HSM Lens - Nikon Fit. The addition of the 18-250mm F3.5-6.3 DC Macro OS HSM speaks to Sigma’s versatile product lineup with this multipurpose zoom lens that offers Optical Stabilization (OS)* and covers wide angle to telephoto to macro photography. It differs from Sigma’s current 18-250mm F3.5-6.3 DC OS HSM lens with its even more compact size, its macro capability with a maximum magnification ratio of 1:2.9 and the use of Thermally Stable Composite (TSC) material currently used only by Sigma.